16 point trophy Boone & Crockett Whitetail Buck harvested in 2004 by Pierre Parise Jr.
Whitetail Deer shown here with Gary holding the deer. 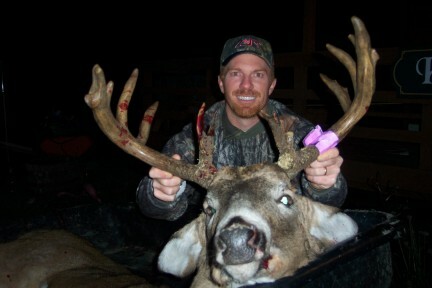 Gary's 160 class Whitetail Buck 2006: 160 green score, 153 dry score. Harvested during Resident Rifle Deer Hunting Season in Northwestern Ontario Canada. 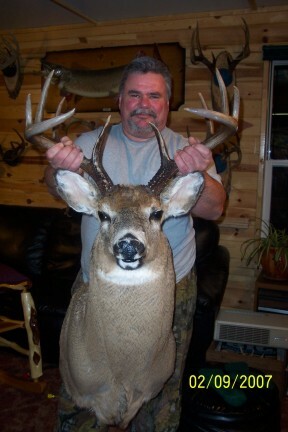 15 point Whitetail Deer harvested by Paul Freeman during rifle hunting season in 2007. Would have been a Boone Buck if he hadn't knocked off all his points while in velvet. Whitetail Deer are numerous in the Rainy River District of Northwestern Ontario. 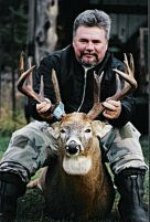 Presently Ontario's deer herd is world class, and our experienced deer hunting guides know how you can get yourself a Trophy Whitetail Buck. Many Whitetail Deer Hunters travel from across the province as well as from many areas of the United States and Canada for that "Big Trophy Buck Experience" that is available here. Some come from as far as the United Kingdom. One of our Deer Hunting Sites. Baited sites with heated tower stands for optimum hunting or wildlife viewing with photography opportunities. Sightings of Bucks, Does and Fawns are common on almost any given day throughout our hunting area. Although there are many Bucks that are seen, there are always those elusive Big Trophy Bucks that are watching your every move to avoid being noticed. That is how they have become mature Bucks. Only the telltale signs the bucks leave behind, like the scrapes and rubs and large hoof prints give their presence away to let you know they are still around. During the rut though, all of these Bucks care not for their own welfare or safety. That’s when all of the Whitetail Bucks, even the Big Trophy Bucks, come out from their safe covering and hiding spots in the woods and leave themselves vulnerable to whitetail deer hunters. This time of the year these bucks are oblivious to everything, (even hunters), everything except the does pasturing the nearby fields. Comfortable Heated Stands that are strategically placed with an average 80 yard shot to the bait site. 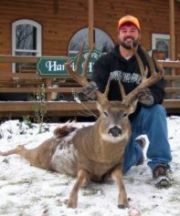 We have exceptional Whitetail Deer Hunting here, with abundant deer and many trophy or Boone & Crockett Bucks. There is a large amount of dense cover and large amounts of unpopulated territory which results in a low pressure hunting area here. Ontario Resident Whitetail Deer Hunters generally only hunt for does for venison meat, leaving numerous Bucks available for you to hunt for your Trophy Whitetail Deer. The success rate for Whitetail Deer Hunts at this camp has always been excellent. We base our success on many things. We are experienced Whitetail Deer Hunters ourselves, with years of practical knowledge. We have a proven track record. The low population of human inhabitants, Coyotes and Wolves in this area, allows for a high number of Whitetail Deer to be able to reside and mature here safely. There are many areas that are known natural feeding ranges for the deer. We have also established deer baits and plots of food in other exclusive areas in close vicinity to our deer hunting Resort. There we have effectively set up our heated hunting shacks, deer blinds and tower stands in strategic locations to allow for opportunities to harvest that Trophy Whitetail Buck without being seen, heard or smelled. We also have set up specific sites to target Deer for those who choose to hunt with Archery Equipment. To further enhance your chance of having a successful deer hunt for that Trophy Buck, we limit the number of hunters harvesting Bucks each season. This also gives all the younger Bucks the opportunity of growing into Mature Trophy Bucks themselves. We are in Hunting Area 10, where we focus our hunts. Non-resident deer hunters have to be guided here, however the guide does not physically stay with you all day. You may be provided with a radio during your hunt in order to communicate with Harris Hill Resort or your deer guide should you harvest that Trophy Buck early. We offer "free range" hunting with a "twist". The quality of the Whitetail Deer Hunt is built in to an affordable pricing system. A minimum 25% deposit is required to reserve your hunt. Plus 200 rounds of ammunition for hunting or 1,500 rounds for use at a recognized shooting competition. Firearms must be registered for a fee of $25.00 CDN (for all your firearms). The printable non-resident firearm declaration form is available where you can view it and print it off, and have it completed before you get to the border. The Non-Resident Firearms Declaration (Form CAFC 909 EF), and its continuation sheet (Form CAFC 910 EF) must be presented in triplicate, unsigned, to a customs officer at your first point of entry into Canada.